Mittens knit up so fast. Especially with a good audiobook to keep you occupied ... This is one evening's worth of knitting. A cuff, the wrist up to where the thumb goes (that white bit gets pulled out and a thumb inserted), and almost to the point of decreasing the top of the hand. I started these last night because the lovely sweater I'm working on for a friend has gotten to the complicated cables at the hem, too much counting to do anything else at the same time, and I was really tired, so I doubted my counting skills. Mittens are mindless knitting, which is exactly what I needed. I should do this more often. Nothing about knitting is mindless! You seriously downplay your gifts. 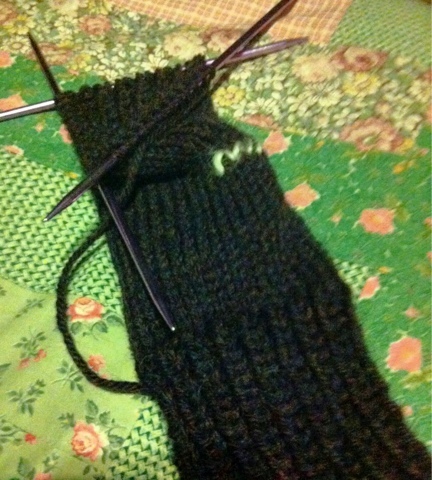 Compared to a lot of the knitting I do, mittens are soooo easy they seem like mindless knitting! No counting, no patterns, nothing tricky at all, just stitch after simple stitch, and in no time, there's a whole mitten there. They are restful. Maybe that's a better word, eh?